Fresh in - rarest of the rare, (in this neck of the woods). 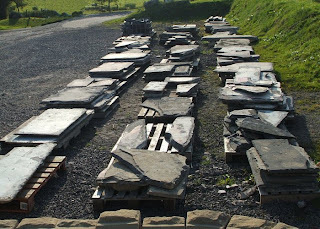 Approximately 60 square meters of Blaenau Ffestiniog Blue flooring slate. The majority of these pieces are of a good size, straight edged, and of even thickness. £95 per square meter for the best condition (Grade A) £65 per square meter for damaged or irregular pieces. This material doesn't come up for sale very often, as very rarely it is removed, due to its long lasting beauty as a floor.